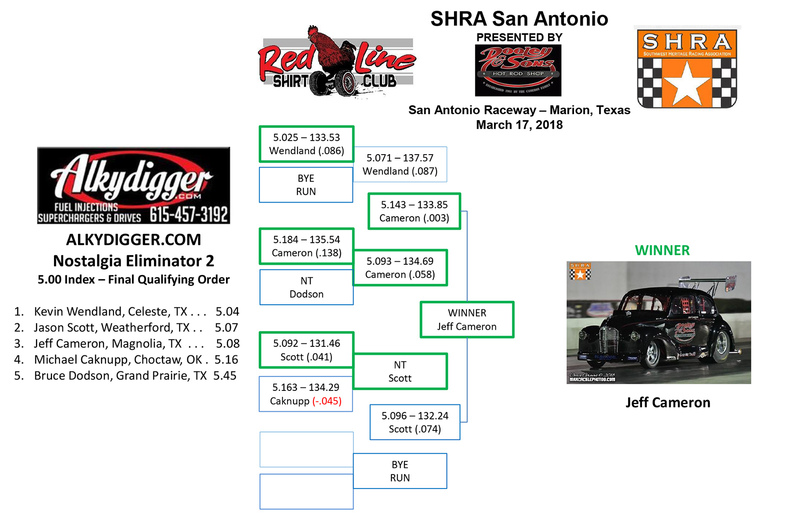 The Southwest Heritage Racing Association, presented by Red Line Shirt Club, kicked off it's sixth season of nostalgia drag racing at San Antonio Raceway on Saturday, March 17th. With the AlkyDigger Nostalgia Eliminator and Nostalgia Super Stock classes on tap, plenty of racing was in store as eager drivers began warming up their cars for the first qualifier. 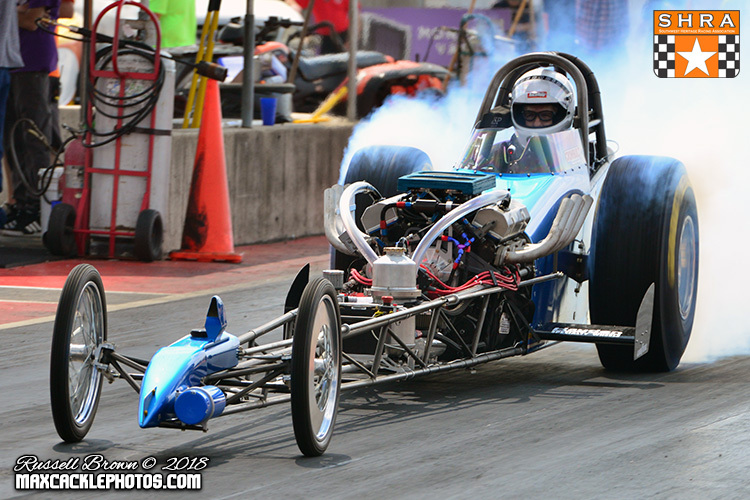 It had been 164 days since the SHRA racers were in competition and the anticipation of getting back on the drag strip was hard to bare. 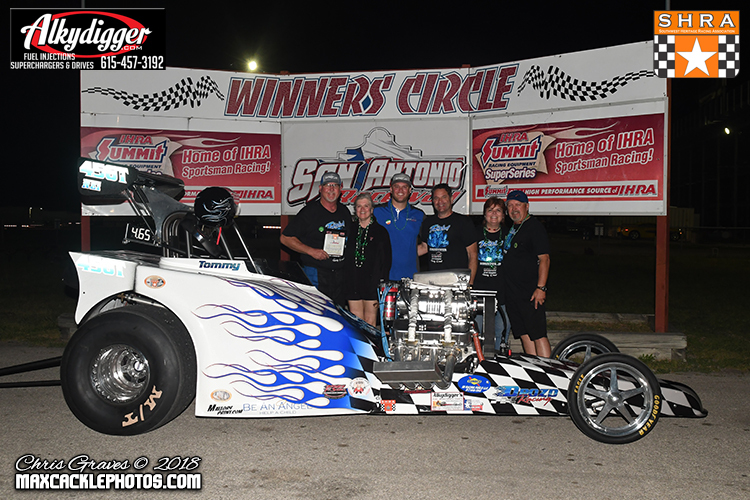 The San Antonio season opener was presented by Dooley & Sons Hot Rod Shop and the 50/50 raffle held by SHRA at each event this year, benefitted the Be An Angel Foundation at this event. With warm-ups complete it was time to get underway with the first of two qualifying sessions. 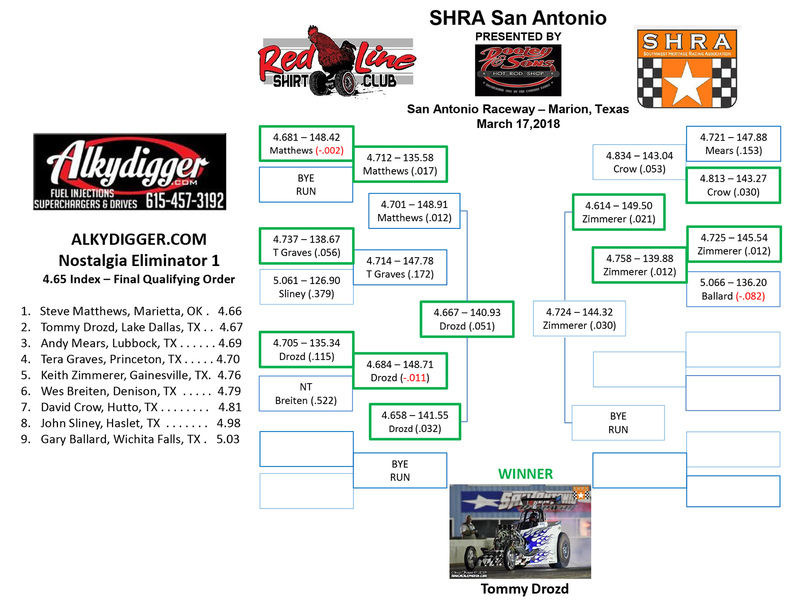 A new index chip draw system was announced in January at the SHRA banquet which was brought in to mix it up a bit for the AlkyDigger Nostalgia Eliminator racers previously running set indexes of 4.65, 5.00 and 5.50. The chip draw would create a scenario where indexes would be within a tenth of those numbers (ex. Nostalgia Eliminator 1 has a 4.60, 4.65 and 4.70 chip). Ironically, the first chip draw of the year resulted in the exact same index numbers previously used in the past five years with no 'mix up' in any of the three classes, so with the indexes set it was time to make final adjustments and head to the line. 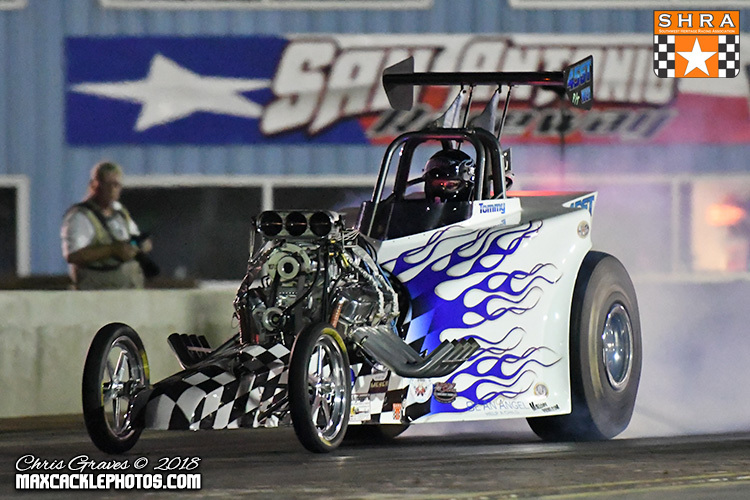 Defending Champion Tommy Drozd was looking to start off the season strong in defense of his title and with 10 cars on the property for NE 1, that would prove to be no easy feat. 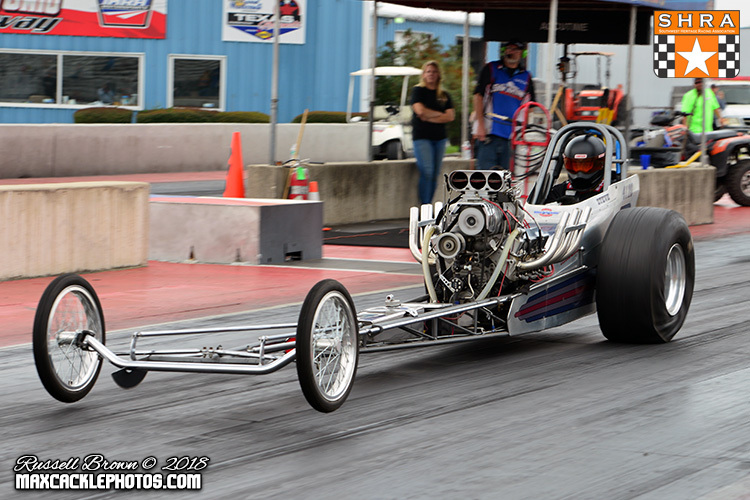 Drozd was able to qualify second with a 4.67 at 148 mph behind top qualifier Steve Matthews. 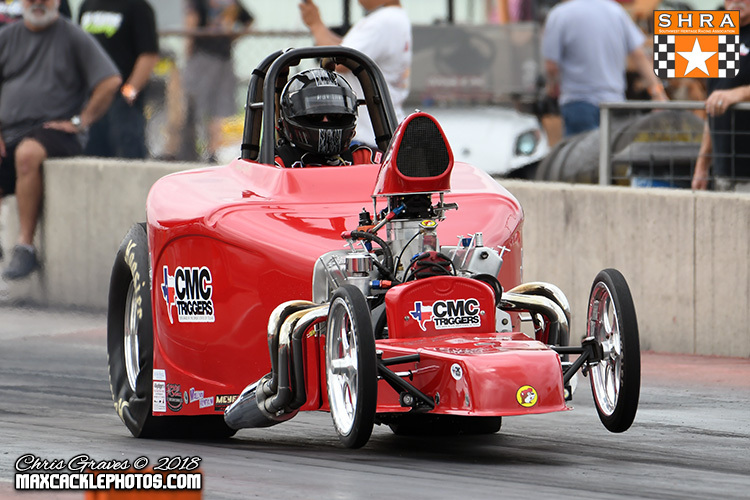 Matthews wheeled his Oklahoma based blown slingshot dragster to a 4.66 at 148 mph to take the top spot. Andy Mears, Tera Graves and Keith Zimmerer rounded out the top five qualifiers. Coming into the semi-finals, Tommy Drozd and Steve Matthews lined up to start off the round. Matthews was off the line first, but his 4.70 at 148 mph came up just short to Drozd' 'perfect' 4.65 at 141 mph. 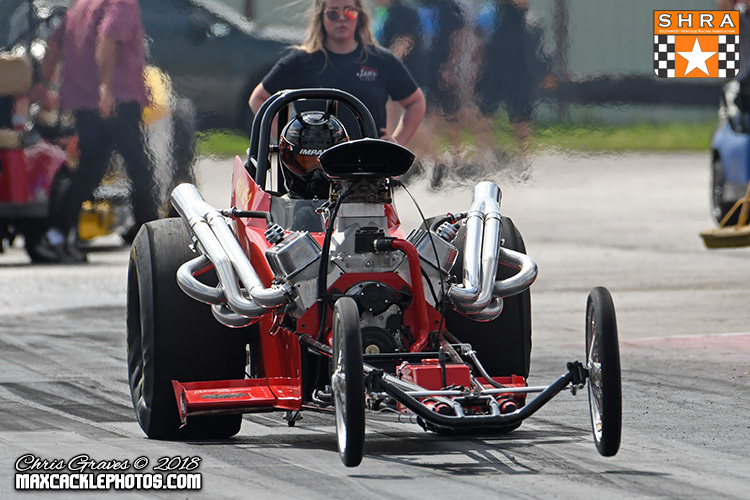 Keith Zimmerer wheeled his blown alcohol altrered to the final round in a bye run with a 4.61 at 149 mph as Drozd and Zimmerer were headed to the finals. After a long day of racing it was time to crown a winner in NE 1 as this pair of blown altereds came to the line. Zimmerer took the jump off the starting line but just ran out of steam at the top end with a 4.72 at 144 mph, with Drozd blasting by with a 4.66 at 140 mph to take the win. Drozd and company have won four of the last five SHRA events dating back to last year and show no signs of letting up as the competition is on full alert. 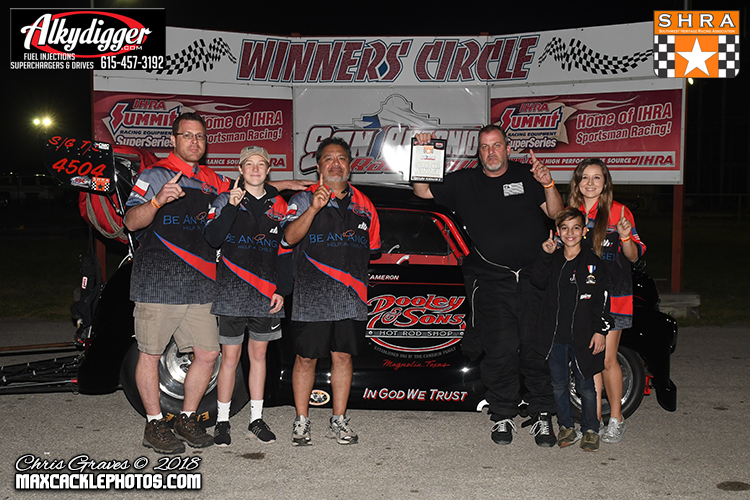 Congratulations to Tommy Drozd and the entire team on an impressive effort in San Antonio! The 5.00 Nostalgia Eliminator 2 category was led by top qualifier Kevin Wendland who's 5.04 at 136 mph held off Jason Scott's 5.07 at 132, good for the number two spot. 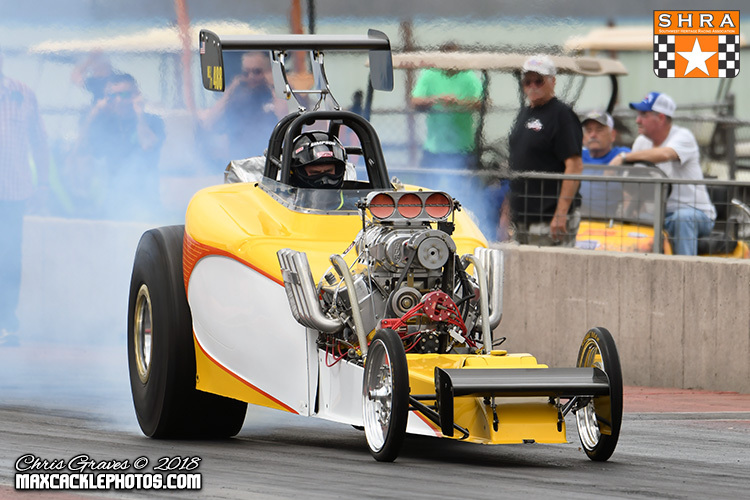 Defending series Champion Bruce Dodson had struggled in pre-season testing and those struggles continued as he rounded out the field with a 5.45. In the opening round, Dodson's troubles ended his day as he was unable to back up from the burnout in his opening match with defending event winner Jeff Cameron. Cameron advanced along with Jason Scott and Kevin Wendland into the semis. Jason Scott scored the bye run and motored his way into the finals to take on the winner between Cameron and Wendland. 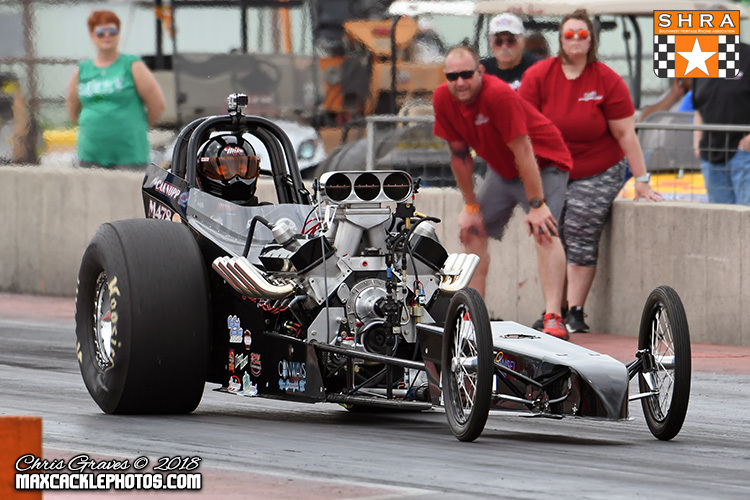 Cameron took the jump off the line and his 5.09 at 134 mph was just enough to hold off Wendland's quicker 5.07 at 137 mph. 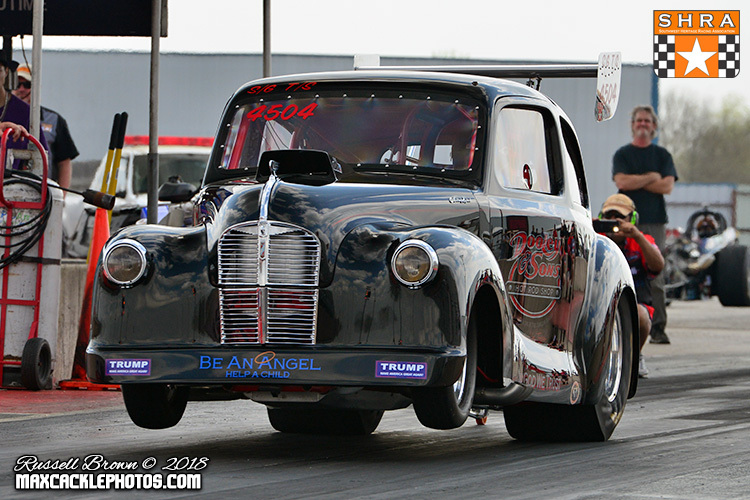 In the final round, a big advantage of Cameron with a .003 reaction time got him out in front and he wheeled the Dooley & Sons 1948 Austin to a 5.14 at 133 mph winning effort over Scott's quicker 5.09 at 132 mph. After a long day of racing, spreading the Be An Angel message in the pits and knocking down win lights, Cameron scored the first NE 2 win of the season and defended his win from last year. Congratulations to the entire Dooley & Sons / Be An Angel team on a job well done!